You are currently browsing the tag archive for the ‘Geraniums’ tag. It doesn’t look or feel like November at my house. The container gardens are still robust. I’ve been harvesting tomatoes every day. I’ve also taken cuttings of the tomato plants and have them rooting inside, on the foyer windowsill near the the basil plants I also brought inside. I’m looking forward to fresh basil all winter long. 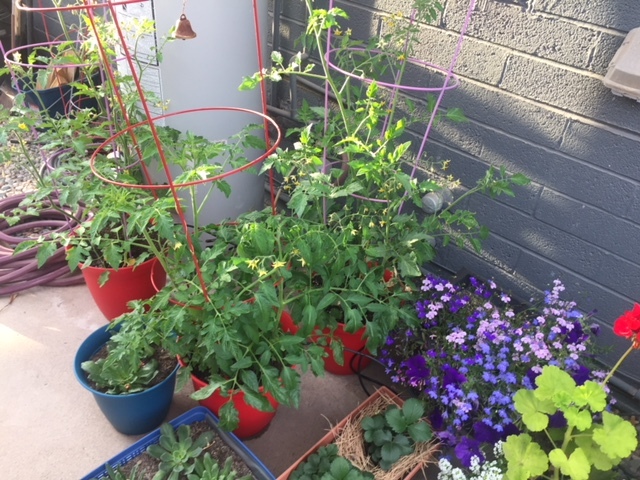 Hopefully tomatoes too, but if not, at least I won’t have to buy new plants in the spring. The blooms look electric in the sunlight. So cool! The plant who is blooming is Crissy, who I got for free from Jericho Nursery a couple of years ago. The others should follow suit shortly. I cannot get over how big of a punch those tiny blossoms pack – they are wonderfully fragrant. Thanks Ginny! I will paint a decorative container for it sometime this winter. It’s time for the Garden Bloggers’ Bloom Day again, yay! You know how much I love flowers! Shadows nonetheless, I’m still happy with how the containers have performed all summer. They have been a joy. I sure will miss them when they’re gone. I have no regrets adding those to my garden. It’s so nice to have blooms indoors. Judging by the buds on the Schlumbergeras, next month will be packed with Christmas Cactus blooms. Fingers crossed anyway. So that’s what’s blooming in and around my casa. If you like flowers as much as me, you should check out Carol’s blog over at May Dreams Gardens. She’s the one who suggested we post photos of our blooms around the 15thish of each month. Thanks Carol, for hosting again. I’ll be back tomorrow with photos from those of you who don’t blog but still want to share their flowers with us. If you haven’t sent photos to me yet, you have plenty of time. Just shoot me an email. I hope to see all of you back here. 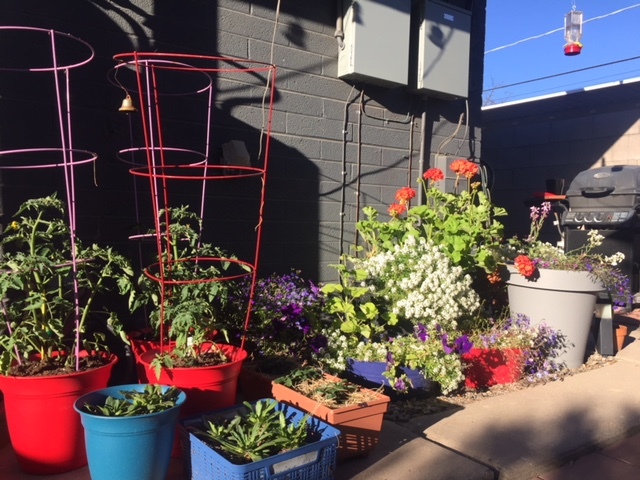 Thanks to Carol over at May Dreams Gardens for encouraging us to post photos of what’s blooming in and around our houses on the 15thish of each month. Check out her blog for more pretty flowers. If you don’t have a blog but would still like to share your flower photos, you can email them to me. Recently I’ve been posting them the day after my own, but tomorrow I have an all-new Ask the Experts scheduled. So let’s aim for Tuesday to publish them instead, our August Garden Nonbloggers’ Bloom Day. That will give you the weekend to shoot photos and get them to me. You can also post them on my facebook wall. I’ll be back tomorrow with the Experts. Hope to see you here!